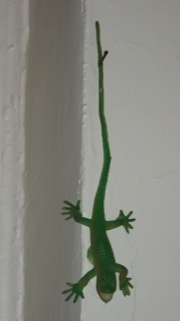 I stuck this plastic lizard-y thing up on my bathroom wall decades ago, because I thought it was fun. It’s still there. It will be there until the day I die, I bet. I find change very difficult, is what I’m saying. But exciting sometimes. Today I’m going to an extra choir rehearsal. I’m a little nervous about it because it’s pouring rain, which means few people will show, which means someone might actually hear me sing. Ack. (I prefer to blend and be invisible, vocally speaking.) I’ve been singing with this choir for about 25 years. This is not really a change issue. Singing is fun. Then, I’m going to a halloween party where I will go as a cold case cop, the same thing I went as last year. This is also not a change issue. I think it’s a lack-of-creativity issue. I can’t figure out another costume from what I’ve got to work with here. The cop costume isn’t bad, except I get nervous walking over to my friend’s house. I’m afraid a cop-hater will hit me. Who watched “It’s the Great Pumpkin, Charlie Brown” last night? I love to wallow in nostalgia. Isn’t “It’s the Great Pumpkin…” like comfort food for the soul-no ? IMHO, a small dose nostalgia every now and again is harmless. When it becomes ones’ raison de etre, that could be a problem. who choose to be nosy. Been there for ages. Love the plastic skeleton in the medicine cabinet.